Every 2000 miles (3200km) the engine oil should be changed. Every 250 miles (400km) the oil level should be checked/topped up. Original oil specified was a mono-grade SAE 30, or for hotter climates (over 90 deg. F./32 deg. C.) an SAE 40. It cannot be stressed too strongly that modern high detergent oils, and especially multigrades, should not be used in an old design of engine. Tales of woe, and sometimes catastrophic disaster (!) in old engines generally, are often traced back to incorrect oil. It is worse still if a change to modern oil is done on an engine that has not recently been rebuilt. Accumulated sludge may be dislodged and then block oilways. Even in a clean 'new' engine, oil consumption may increase, and piston-rings might stick/break. Ignore any claims that the above warnings are myths. All those in the world of preserved transport who learned the hard way, did not imagine their problems/disasters. I've experienced it, know others who have, and know overhaul engineers with a lifetime in marine/railway/car engine work, who have dealt with the consequences. Risks of major disasters diminish if your engine has been converted to full-flow oil filtering (not bypass oil filtering). But the ancient AC design also lacks good air filtering and has the larger running clearances found in 'vintage' engines. Less air filtering means more sludge. Larger clearances, and high relative surface velocities (within bearing surfaces) can affect the performance of multigrade oil, reducing its effective viscosity. That can also cause increased oil consumption. Another possible risk is oil drainage off the engine parts while switched off and standing for a while. This tends to be worse with multigrades, although it depends on the particular oil used. Synthetic oils might work very well, but would still need to be changed at short intervals, which defeats their biggest benefit - long life. 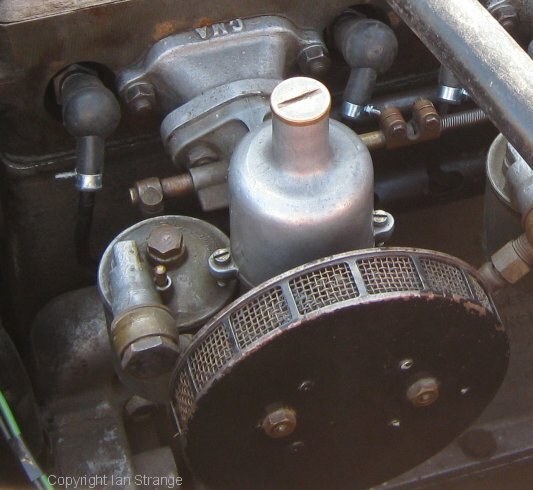 The AC engine was not originally fitted with a full-flow oil filter. There is a gauze filter to try to prevent any large debris from entering the oilways, but this has nothing to do with removing the fine metal dust that a modern filter deals with. 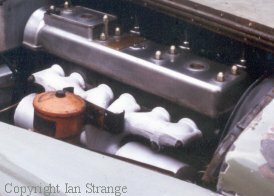 Later engines (from about 1951/52) had a Fram by-pass filter mounted on the exhaust manifold. I believe that its element should be renewed every 10000 miles (16000km). Replacement filter element was the Fram C3, or equivalent such as Greyfriars 530P. Some engines have since had full-flow filters installed, but it is important that the flow of oil has not been impaired by this modification. It is open to question whether this mod. will allow an increase in mileage between oil changes. Oil life is also influenced by contamination by acid and water, plus the amount of dust drawn in passed the (rather primitive) air-filters. If a conversion to full-flow filter is planned, then it is best to get one that includes the pressure relief valve. Remote filter/valve units are available although I have not tried any myself. The AC's cooling system is not pressurised, therefore it runs at a cooler temperature than more modern systems, that is, around 75 deg. C. A certain amount of coolant is lost via the radiator overflow pipe, and so it needs regular checking and topping up. The alloy engine castings are prone to corrosion, and so an anti-freeze with corrosion inhibitor should be in use all year round. Coolant capacity is 17 pints (9.6 litres). Important note: Don't use modern long-life anti-freeze which contains corrosion inhibitors that will do serious engine damage. The choice of coolants becomes more extensive as time moves on. Originally, the AC would have used tap water, and (if required) the addition of methanol as an anti-freeze during the winter months only. Or else draining out the cooling system if storing the car during frosty weather. That last option is just about the worst practice, as far as corrosion is concerned. Tap water and methanol are great for heat transfer but poor for corrosion protection. The introduction of ethylene-glycol (EG) anti-freeze brought more corrosion/deposit troubles until suitable additives appeared, permitting year-round use of EG/water mix. A downside is reduced heat transfer. Depending on your circumstance, you might want to keep the concentration down to about 30%, to help keep things cooler? Although bittering agents have been added to EG anti-freeze to try and reduce poisoning incidents, I am sceptical about their likely effectiveness, so always treat this substance as dangerous. Keep an eye out for water-pump leaks on the AC! Propylene-glycol (PG) anti-freeze has also been produced in an effort to safe-guard against poisoning, but PG/water mix has slightly higher viscosity (and thus lower heat transfer). Evans Waterless coolant is almost entirely PG, although its overall effectiveness is a subject of much debate. I don't know of any AC engine experiences with Evans. The quality of the water used in the coolant should be considered. Tap water is best avoided. Either dionised or reverse-osmosis water would be a good idea to minimise corrosion. If anti-freeze isn't needed, then pure water with an anti-corrosion additive is a possible option. The usual recommendation for the AC is EG/water mix. But be sure to change it according to the maker's instructions (usually 2 years). The water-pump design is definitely not the best part of an otherwise superb engine! The pulley is forward of the ball-race bearing, and this effectively places some extra load on the plain bearing at the rear of the spindle, and increases its wear rate. The water seal is a carbon gland, which to some extent relies upon centrifugal force to keep the water from escaping. For that reason, leakage will be greatest at low revs. If rebuilding a pump, the carbon gland needs quite a bit of bedding in before it seals well. This can be done on a workbench using an electric drill. Many owners have tried modifications to improve the design, but I don't have details of any of the successful ones. As an added precaution, I used to carry a short fan-belt in the car, which can be used to drive the fan, but not the pump, just in case the pump bearing fails (through water leakage). Reconditioned pumps are now available from AC engine specialists. See the links page. The thermostat is of the bellows type. Over time/usage, it will tend to open at too low a temperature, or else stay open. Assuming that the bellows are not leaking, I understand that it is possible to correct this by re-soldering the valve onto its stem to adjust its position. The original top radiator hose is of an unusual design, with a large convolution. This is because the thermostat outlet and the radiator inlet are very close together, and movement of the engine would place excessive load on the pipes if a conventional hose is fitted. I never did find a supply of these while I was running my car. I have since noticed that hoses known as "hump hoses", for use with turbo-chargers, are similar in shape, although usually with a less pronounced bulge. These might make a good alternative in the absence of the original type. The fuel pipe exits the tank from its underside, which makes it awkward if blockages occur. If the tank has rusted during long idle periods, then the pipe may block if the tank filter is not in good condition. This filter is a soldered brass gauze assembly. Early cars (up to about 1950) also had a low mounted fuel filter on the bulkhead, which is below the tank level. If it has to be disconnected, the front/left of the car should be jacked up first. The electric fuel pump I found on my AC, was an S.U. type AZX 1332. However, the SU company lists this as a high-pressure pump for mounting at the fuel tank. So, I assume that the low pressure equivalent, will be the AUA25. These are reliable just as long as they are in frequent use and are correctly maintained. If you ever dismantle the pump and refit/replace the diaphram, remember that it needs to be tensioned by applying current to the solenoid while the casing screws are tightened up evenly. Repair kits and new pumps are still available, although some components differ from the originals. These electric pumps are often criticised by owners and mechanics, but it is improper over-haul and maintenance that renders them troublesome. They have given reliable service on ACs, Morris Minors, Land Rovers, etc. for many years, so if persistent problems do occur, then past mis-treatment of the pump will be the root cause. I have heard of diaphrams shrinking, in which case it will need to be dismantled and re-assenbled so that it can be re-tensioned. Lack of use can cause trouble with the contacts (especially in damp climates), and these should be cleaned with something soft - certainly nothing abrasive. This is probably the most common mis-treatment of SU pumps, when contacts are damaged by cleaning with abrasives. Electronic versions are available which removes the contact breaker issue. Fuel supply troubles are often caused by other issues such as blockages. Check to see if any debris is building up in the fuel filter bowl. If so, check the gauze filter in the petrol tank outlet. It might also help to have the inside of the tank resin coated to prevent internal rusting. The S.U. carburettors are type HV2 Thermo. Parts and repair kits are available from Burlen Fuel Systems. Very little wear takes place in the throttle-spindle holes in the casings, so renewing the brass spindles should take up any wear. I would recommend oiling the throttle spindles occasionally. One potentially dangerous problem with the float chambers, is that if completely drained at any time, the float valve may stick open. I found this to be even more likely with the replacement (modern) valves installed. The solution is to place washers under the float to prevent it from dropping to the bottom. Old washers from the carburettor jets are ideal. Please note that these old style SU carburettors do not have the oil damper in the top of the dashpot that later SUs had. The more modern SUs found on many classic cars, had a plunger attached to the filler cap, and this required a certain amount of oil to function. The old SUs found on most AC 2 Litres use trapped air to provide damping. This does require a small quantity of oil (SAE 20/light machine oil/bicycle oil) to seal the air in at the bottom. The small hole in the cap restricts the flow of air as the piston rises, giving the required damping. When the engine is switched off, if you lift the piston quickly, any excess oil will squirt out through the hole in the cap. I'm not sure how often these should be cleaned, but the procedure is to open them up and wash out with petrol or kerosene oil. Then dip them in engine oil (the dirt sticks to this) and reassemble. This is a prequel to an article I hope to write when my AC engine is up and running. Quite a few modern articles on this topic omit some of the important principles that one needs to know. If you are keen on this subject, then I strongly recommend reading the works of the late and great Sir Harry Ricardo, especially his earlier textbooks. Ricardo set much of the groundwork in fuel research and piston engine design that we still rely upon. Fuel combustion and all its effects on an engine, is a very complex topic, but I have picked out a few points from Ricardo's early research, that might be interesting or useful. Note that the design of the AC engine is less sensitive to some of the modern fuel issues, that concern owners of other vintage engines. Further down the page, I've looked into some of the more practical aspects that might affect us. This is widely mis-understood even though Ricardo established the principle by the 1920s. When an engine is running with a closed throttle, the low pressure in the manifold means that most or all of the petrol is in vapour form, and the walls of the manifold are dry. If the throttle is suddenly opened, the rise in manifold pressure will cause the fuel to condense and wet the manifold walls. This briefly starves the engine of fuel, hence the need for an over-rich mixture for a split-second. If a carb supplies 4 cylinders, then there will be a lot of manifold area to wet. In the case of the AC, each carb supplies 2 cylinders, and so this requirement is of a smaller magnitude. On many carburettor designs, there is a pump to squirt that extra fuel in. How it works on an SU carburettor is less obvious. When the throttle opens, there is a slight time-lag in the upward movement of the piston. So, for a split-second, the piston restricts the air-flow. It also continues to restrict the fuel jet, but the amount of fuel issuing from the jet depends in part on the pressure above it in the choke, which at that moment is very low (due to the high speed of the air). Hence, a rich mixture, momentarily. The speed of the piston rising is affected partly by its mass and also by any damping in the design. The AC does not have the oil-filled plunger, but it still has some damping, courtesy of the air being forced through a tiny hole in the cap. 2) Ethyl-Alcohol is not our Enemy! With all the problems reported in the classic car world, it is easy to over-look the benefits of alcohol (ethanol) fuel, as researched by Ricardo back in the 1920s. The biggest positive property is its very high latent heat of evaporation - about 3 times as high as for petrol. That means it cools the incoming charge into the engine and thus improves the volumetric effiency. That raises the power and efficiency overall. The temperatures of the whole 4 stroke cycle are lower compared to petrol. Its cooling effect can be enough to prevent all of it vapourising during induction, and so some pre-heating in the inlet system can help. That might sound contradictary, but that's how it works! Since alcohol brings along some of its own oxygen, the air/fuel ratio differs, and the additional fuel adds to the charge-cooling effect. With some ethanol added to modern petrol, it is usually recommended to make the mixture a little bit richer, otherwise the weaker combustion will be slower. Alcohol's boiling point of 78 deg. C is towards the low end of the boiling point range of the components of petrol, and closely related is its fairly high volatility. High volatility is a bonus for carbs that feed a lot of cylinders, but less useful for the AC and similar set-ups. It might add to vapour-lock troubles in hot weather, but the AC is not prone to this issue. You might need to change some of the components in the carbs and fuel pump to make them compatible with added ethanol in petrol. Cork seals in the carb jets might be a problem, and also the pump diaphram and the flexible hoses. If the car is left to stand for long periods, then water separating from the fuel might cause corrosion so look out for any well recommended additives for prevention. In the UK, the FBHVC has a list of approved additives. Adding alcohol to petrol was fairly commonplace during the middle part of the 20th century. In the UK, Cleveland Discol contained 15 percent alcohol (and no lead additive). The complexity of this subject makes it hard to pick out a few points without losing the context, but I will try! i) Normal burn rate of fuels. The natural speed of burning of any given hydrocarbon fuel has no noticeable influence on its actual speed of burning in an engine. The natural burning speeds are extremely slow, and only become fast enough when the air-fuel mixture is in a state of turbulent movement. It is also influenced by pressure and mixture strength (too rich or lean can slow things down). ii) Latent heat of evaporation. This is a really important quality of fuel, since its cooling effect increases the fuel/air charge entering the cylinders, and reduces the pumping losses for the induction strokes. To take full advantage of latent heat, some heat may need to be added to the mixture. iii) Residual exhaust gases. Burnt gases left over from the previous cycle, tend to heat up the incoming charge, but also help to limit the peak temperature during combustion. iv) Dissociation and recombination. It's easy to think of the combustion as a single set of chemical reactions, but while the temperature remains high, dissociation also occurs. That is, carbon-dioxide splits to leave carbon-monoxide, and water also dissociates. However, some of this recombines. The result of all this action is that the temperature does not fall as much as expected during the expansion stroke. v) Volatility. Surprisingly, some variation in volatility will have no influence on the volumetric efficiency. It will simply alter the point at which the fuel evaporates. Volatility is important when a carb supplies many cylinders, to aid even distribution. vi) Heat flow to cylinder walls. Ricardo's research showed that the amount of heat-flow to the cylinder walls, is at a maximum when the air/fuel ratio is at stoichiometric. But note that the tests were done with the ignition timing adjusted for optimum output, and the on the weak mixture side, he did not test beyond 20 percent weak (to maintain even running). vii) Boiling range of petrol. In Ricardo's day, the boiling point range for petrol was typically from 50 to 200 deg. C. Today, the lower end is below 30 deg. C.
Most of what follows is not from Ricardo. The pre-war specification of certain brands of petrol were listed in the book "The Motor Vehicle", 3rd edition 1941 (by K. Newton and W Steeds, published by Iliffe). Some of that data is shown below. Initial boiling point 40 deg.C. Final boiling point 193 deg.C. Initial boiling point 31 deg.C. Final boiling point 185 deg.C. Initial boiling point 50 deg.C. Final boiling point 192 deg.C. Final boiling point 195 deg.C. Initial boiling point 34 deg.C. Final boiling point 180 deg.C. As you can see, quite a high ethanol content was tried many years ago. A graph of evaporation against temperature was also in the same book, showing 4 of the above fuels (Esso Ethyl was omitted). This used the Engler process of distillation to provide a rough guide of how volatile each one is. Cleveland Discol, with its 15 percent ethanol, showed rapid evaporation up to about 80 deg. C., the graph then stepping into line with the other fuels. National Benzole Mixture had the lowest evaporation at low temperatures, until above 90 deg. C. when its rate of evaporation became higher than the other fuels. In the UK, the lead content of petrol was reduced in 2 stages, bringing it down to about one sixth of the old value in 4-star. Presumably, 2, 3 and 4-star would then have had the same low level. To achieve the 4 star octane rating, without great expense, use was made of butane. This has a boiling point (BP) of around 0 deg. C. (or -10 for iso-butane), and thus the volatility of the fuel was increased. Us vintage drivers did not notice until 1989 when 2 and 3-star were withdrawn to make room for unleaded. We had to switch to 4-star, but unfortunately, this coincided with a hot spring and summer, combined with this more volatile fuel. Many classic car owners experienced hot-restart troubles and over-heating. a - The viscosity of petrol changes with temperature and can cause a richer mixture when warm. b - Carburettors don't usually fully compensate for changes in air density, so that when the temperature rises and the air expands, the mixture becomes richer. c - If the more volatile fractions separate from the rest of the fuel, from the carb jet, the properties of the segregated fuel might change, such as octane rating and latent heat. The old lead additive boiled at a high temperature, and so this could have been a source of trouble from 1989. For 21st century fuel, alcohol plays a part in this segregation problem, (boiling point 78 deg. C.). If these 'lighter' fractions boil away before reaching the jet, then the latent heat of the remaining fuel might be lower, especially if it is hot enough to lose some of the alcohol. This would raise the temperature within the 4-stroke cycles. d - Any boiling away of fuel in the float chamber or jet will be topped up automatically, and very quickly if there is an electric pump. The level in the jet itself, will be instantly maintained due to the large volume of fuel in the float chamber. Unless, that is, the supply is interrupted by really bad vapour-locks. e - Boiling away of fuel will self-regulate its temperature due to latent heat of evaporation. Imagine boiling water in a saucepan, and its temperature will usually be maintained just above 100 deg. C. as latent heat uses up the excess heat applied. In a carburettor, only the more volatile fractions will be boiling, and the temperature will reach an equalibrium as latent heat balances applied heat. f - Excessive evaporation from the jet aperture, will enrichen the mixture. g - Boiling fuel from under the jet might cause some over-flow of liquid petrol, and this is caught (in an SU carb) by a trough that surrounds the jet. That keeps the overflow excess within the venturi ready to be vaporised, but causing temporary enrichment. h - The extremely high latent heat of alcohol, means that modern fuel will be better at preventing excessive heating of the carbs and inlet tract. It also has a lower flame temperature, and lower final temperature at the exhaust exit. That last point assumes that the mixture has been adjusted for the alcohol content. However, a larger proportion of lost heat goes to the exhaust (rather than coolant) when compared to petrol. This might affect those engine designs with exhaust and inlet manifolds close together. i - An extremely over-rich mixture will burn slowly, just as a weak mixture does. The fastest combustion is slightly on the rich side. And over-rich in the greatest extreme will stop an engine running (just as the opposite extreme would do). j - During an attempted hot restart, the venturi and inlet passage might be saturated with fuel vapour. k - The strength of the ignition spark can be sensitive to changes in fuel, when the engine is running on light load, and/or weak mixture. Volatility of the petrol can affect this, and might cause cycle-to-cycle variations including delayed combustion (maybe leading to high running temperature). l - The AC has a low-pressure fuel pump mounted on the bulkhead/firewall. Although the depression caused in the main fuel line might be expected to encourage vapour locks, the AC has a high mounted fuel tank. Thus, there is a head of pressure to start with. 7) What to do about it? Fuel/air mixture: Make sure the mixture setting is corrected for the alcohol content of the petrol. This means enriching it slightly, since alcohol brings along some of its own oxygen. Spark-plug gap: It might be worth experimenting with a wider spark-plug gap, if you notice mis-firing under part-throttle loads. Electronic ignition would help to minimise variations between individual firing strokes, and thus better control of the combustion. Dead-end silencers: That pair of silencers on the AC's manifold, transfer a lot of heat. Some owners remove them, especially as they can warm up your feet on a hot day. But you might miss them in the winter! Alternatively, you could make insulated covers that can be removed if required, but be aware that any oil soaking into them might create a fire risk. Bonnet prop: The bonnet louvres help to release warm air, especially when the car is stationary. It will be more effective if you prop the rear of the bonnet up a little bit. I made a wooden packing piece to fit over the rear hinge bracket and used it in hot weather. Electric fan: Most of the air passing through the engine bay has been heated by the radiator. The greater the rate of air-flow, the smaller will be its temperature rise. If the fan can run after the engine has switched off, then the air temperature will fall more quickly, even though it's still shifting heat from the engine coolant. Compression ratio: A higher compression ratio improves efficiency, such that heat flow to the coolant and to the exhaust, are reduced. If you are rebuilding an engine, and are contemplating a compression ratio increase, then this would be an added bonus to consider. Engine air-duct: It would be ideal if air was ducted directly from the front of the car to the carburettors. This is not a feature of the AC, but might be an option if you are not bothered about original appearance. Rubber and cork parts: As mentioned earlier, seals and diaphrams need to be compatible with ethanol. Avoid letting the car stand for very long periods. Fuel additives might be an option, as long as they are tested and approved/recommended. Kerosene: I would not recommend adding this to fuel, to control volatility. It's high boiling point means that it might wash away lubricant, add to cylinder wear, and contaminate the lubricating oil. Its latent heat properties are very poor, reducing power output. This was researched by Ricardo in his early years.